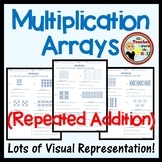 Multiplication (Repeated Addition) Arrays - 3 No-Prep Printables! 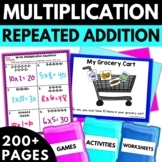 Two page worksheet set that focuses on linking repeated addition to multiplication. This worksheet set gradually gets more difficult. It starts easy and then has students apply the skill to word problems. 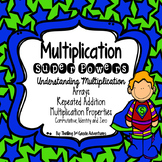 Students will practice modeling multiplication varies ways - as an array, repeated addition sentences, grouping, and finally writing a multiplication sentence.